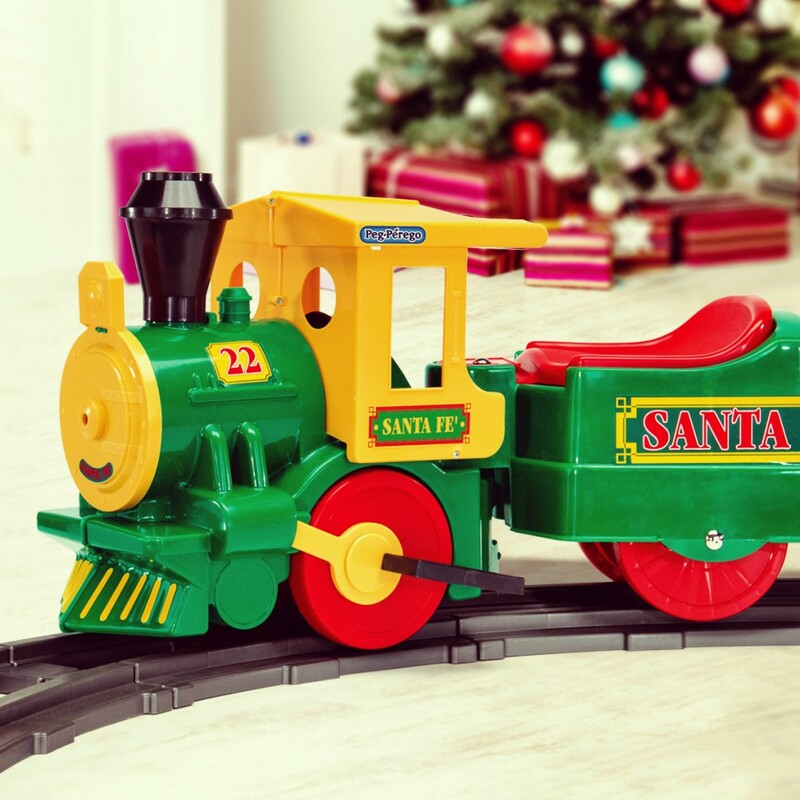 Electric cars for children and a great classic, the legendary toy train, to surprise your child this Christmas! What are you going to give your child for Christmas? Run out of ideas? There are gifts you remember forever. If you’re a parent, it’s all about the joy of having fulfilled your child’s greatest wish. But sometimes it’s up to you, an adult who has not forgotten what it’s like to be a child, to produce something your child would never have expected, but loves just the same. This means you’re a far-sighted parent who leaves plenty of room for the imagination. Like a father who doesn’t just give his child a toy sports car, but a real electric car for children. We at Peg Perego have a lot of experience in this area, and here’s what we’ve come up with for Christmas 2017. 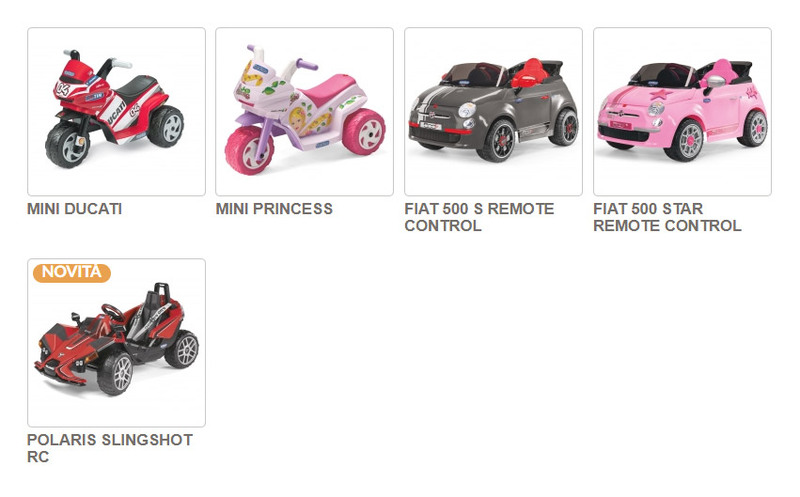 All the quality and safety of Italian-made toys for your child! Do you feel that safety means control? 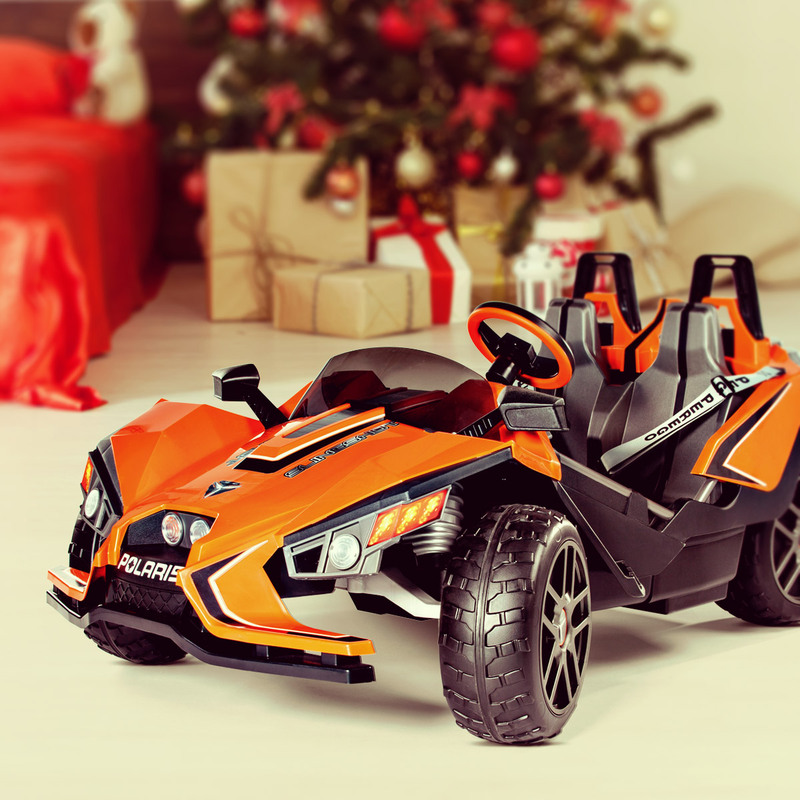 Then the Polaris Slingshot RC (Remote Control) is what you need. An electric car with a SMART Bluetooth® remote control for controlling the car without interfering with other remote-controlled vehicles or devices (such as electric gates). And if you forget to bring the remote control, you can use your smartphone! 2 165 W gear motors let you easily cover the most jagged terrain and up to 10% gradient slopes. The Fiat 500 S Remote Control and Fiat 500 Star Remote Control also feature Bluetooth® SMART remote controls!! Does your three-year-old want to ride around with friends? How about a two-seater! Two children can play together, brothers, sisters or friends, from age three and up with Polaris Slingshot 12V, the two-seat electric car. Futuristic design inspired by the American car, the Polaris. 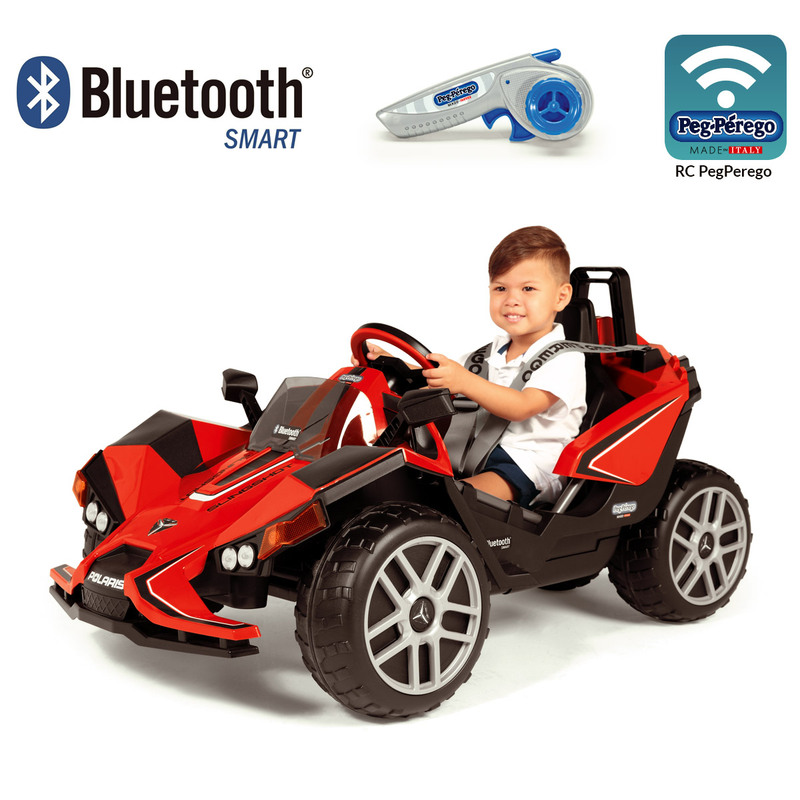 In addition to the features of the single-seater version, it has FM radio and an MP3 input, a passenger safety belt, wheels with sculpted tread and two roomy ergonomic seats, to make your child feel like a race-car driver! This fantastic car is also more powerful. 2 powerful 230W gear motors let you easily cover the most jagged terrain and up to 17% gradient slopes for fun without limits! 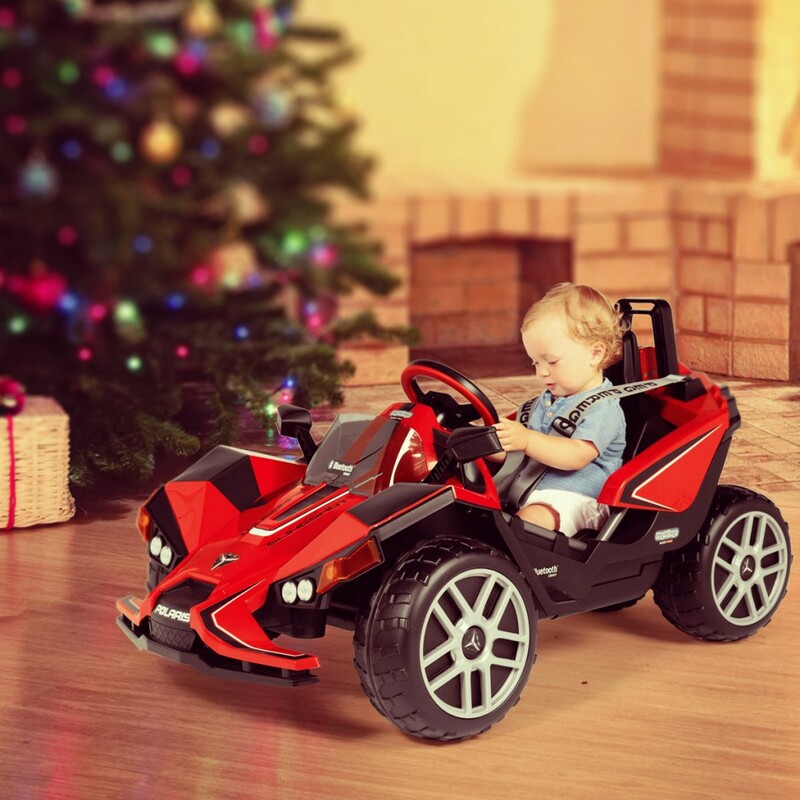 Your child will have plenty of adventures, alone or with friends, in the Polaris Slingshot 12V! Tell me, Dad, aren’t you a little bit jealous? All aboard! The dream train is about to depart! Already a little engineer at two! Runs on a rechargeable 6 Volt/4.5 Ah battery. All aboard! The Santa Fé Train is about to depart! All Peg Perego electric toys have a sealed base to protect the driver from electric wires and tampering and to protect the vehicle from rain, water, mud and sand. 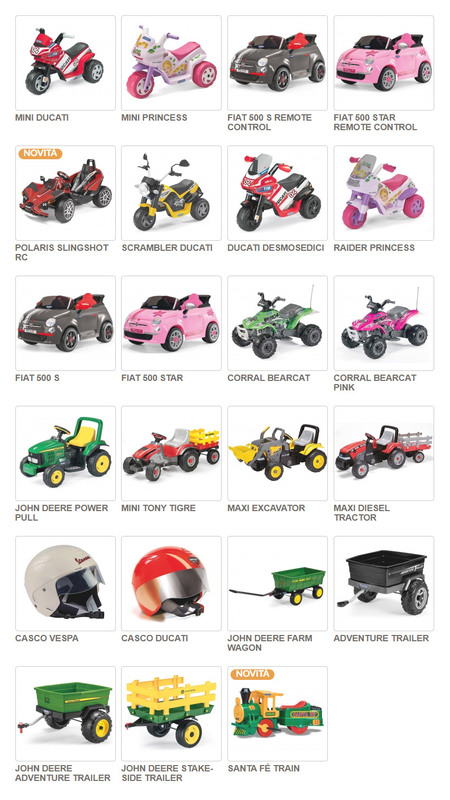 Looking for an electric motorbike or car for your child? 1+ : in the saddle or in the car to drive like a grown-up from the age of one year up. 2+ : motorbike, car, or tractor? When you’re two, you can choose! 3+ : full speed ahead from the age of three! 6+ : when the going gets tough, the tough… have a great time! ...... A SURPRISE WHEN YOU OPEN IT, A SURPRISE WHEN YOU CLOSE IT. Discover here THE NEW BOOK POP-UP! The Booklet 50 S stroller: performance in just 50 cm. Now that’s what I call strolling! Baby bag – Can a mum do without one? Ready to help dad out with the Deere Construction Loader? Become a Peg Perego fan!